Good Friday is observed on the Friday before Easter Sunday. 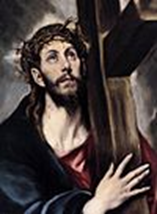 On this day Christians commemorate the passion, or suffering, and death on the cross of Jesus Christ. It is also known as Black Friday, Holy Friday, Great Friday, or Easter Friday though the latter normally refers to the Friday in Easter week. Based on the details of the Canonical Gospels, the Crucifixion of Jesus was most likely to have been on a Friday (John 19:42). 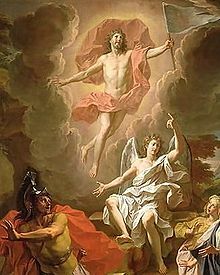 The estimated year of Good Friday is AD 33, by two different groups, and originally as AD 34 by Isaac Newton via the differences between the Biblical and Julian calendars and the crescent of the moon. A third method, using a completely different astronomical approach based on a lunar Crucifixion darkness and eclipse model (consistent with Apostle Peter's reference to a "moon of blood" in Acts 2:20), points to Friday, 3 April AD 33. According to the accounts in the Gospels, the Temple Guards, guided by Jesus' disciple Judas Iscariot arrested Jesus in the Garden of Gethsemane. Judas received money (30 pieces of silver) (Matthew 26:14-16) for betraying Jesus and told the guards that whomever he kisses is the one they are to arrest. Following his arrest, Jesus is brought to the house of Annas, who is the father-in-law of the high priest, Caiaphas. There he is interrogated with little result and sent bound to Caiaphas the high priest where the Sanhedrin had assembled (John 18:1-24). Conflicting testimony against Jesus is brought forth by many witnesses, to which Jesus answers nothing. Finally the high priest adjures Jesus to respond under solemn oath, saying "I adjure you, by the Living God, to tell us, are you the Anointed One, the Son of God?" Jesus testifies in the affirmative, "You have said it, and in time you will see the Son of Man seated at the right hand of the Almighty, coming on the clouds of Heaven." The high priest condemns Jesus for blasphemy, and the Sanhedrin concurs with a sentence of death (Matthew 26:57-66). Peter, waiting in the courtyard, also denies Jesus three times to bystanders while the interrogations were proceeding just as Jesus had predicted. In the morning, the whole assembly brings Jesus to the Roman governor Pontius Pilate under charges of subverting the nation, opposing taxes to Caesar, and making himself a king (Luke 23:1-2). 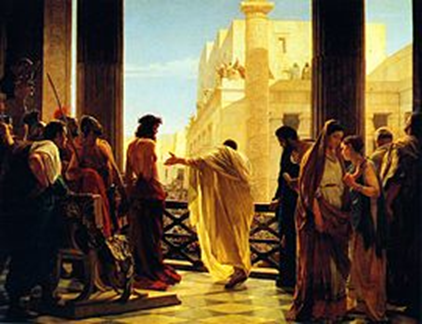 Pilate authorizes the Jewish leaders to judge Jesus according to their own law and execute sentencing; however, the Jewish leaders reply that they are not allowed by the Romans to carry out a sentence of death (John 18:31). Pilate questions Jesus and tells the assembly that there is no basis for sentencing. Upon learning that Jesus is from Galilee, Pilate refers the case to the ruler of Galilee, King Herod, who was in Jerusalem for the Passover Feast. Herod questions Jesus but receives no answer; Herod sends Jesus back to Pilate. Pilate tells the assembly that neither he nor Herod have found guilt in Jesus; Pilate resolves to have Jesus whipped and released (Luke 23:3-16). Under the guidance of the chief priests, the crowd asks for Barabbas, who had been imprisoned for committing murder during an insurrection. Pilate asks what they would have him do with Jesus, and they demand, "Crucify him" (Mark 15:6-14). Pilate's wife had seen Jesus in a dream earlier that day, and she forewarns Pilate to "have nothing to do with this righteous man" (Matthew 27:19). Pilate has Jesus flogged and then brings him out to the crowd to release him. The chief priests inform Pilate of a new charge, demanding Jesus be sentenced to death "because he claimed to be God's son." This possibility filled Pilate with fear, and he brought Jesus back inside the palace and demanded to know from where he came (John 19:1-9). Coming before the crowd one last time, Pilate declares Jesus innocent and washed his own hands in water to show he has no part in this condemnation. Nevertheless, Pilate hands Jesus over to be crucified in order to forestall a riot (Matthew 27:24-26) and ultimately to keep his job. The sentence written is "Jesus of Nazareth, King of the Jews." Jesus carries his cross (see picture) to the site of execution (assisted by Simon of Cyrene), called the place of the Skull, or "Golgotha" in Hebrew and in Latin "Calvary". 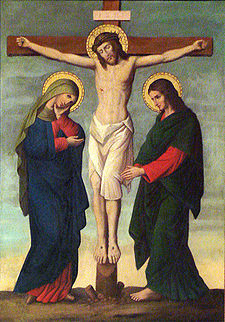 There he is crucified along with two criminals (John 19:17-22). Joseph of Arimathea, a member of the Sanhedrin and secret follower of Jesus, who had not consented to his condemnation, goes to Pilate to request the body of Jesus (Luke 23:50-52). Another secret follower of Jesus and member of the Sanhedrin named Nicodemus brought about a hundred pound weight mixture of spices and helped wrap the body of Christ (John 19:39-40). Pilate asks confirmation from the centurion whether Jesus is dead (Mark 15:44). A soldier pierced the side of Jesus with a lance causing blood and water to flow out (John 19:34), and the centurion informs Pilate that Jesus is dead (Mark 15:45). Joseph of Arimathea took Jesus' body, wrapped it in a clean linen shroud, and placed it in his own new tomb that had been carved in the rock (Matthew 27:59-60) in a garden near the site of crucifixion. Nicodemus (John 3:1) also brought 75 pounds of myrrh and aloes, and placed them in the linen with the body, in keeping with Jewish burial customs (John 19:39-40). They rolled a large rock over the entrance of the tomb (Matthew 27:60). Then they returned home and rested, because Shabbat had begun at sunset (Luke 23:54-56). On the third day, Sunday, which is now known as Easter Sunday (or Pascha), Jesus rose from the dead.